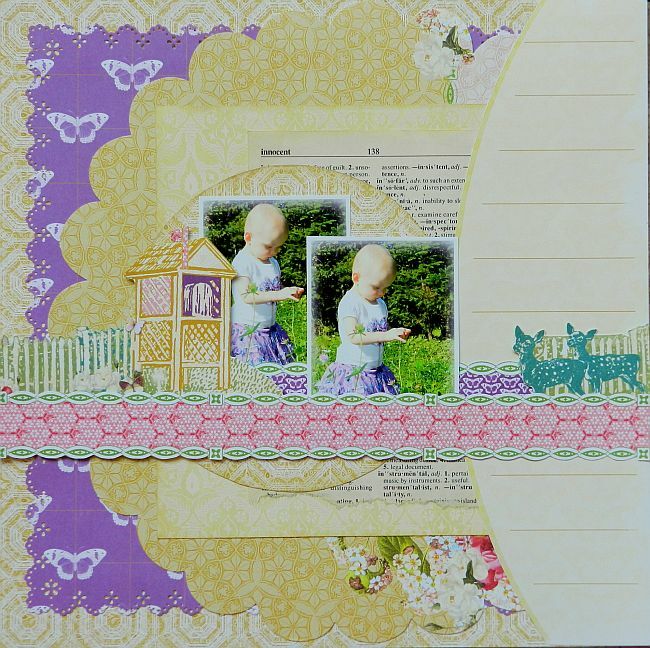 Erin Blegen: My Scrap Cabin: Webster's Pages: Old & New How-To! Good morning to you! 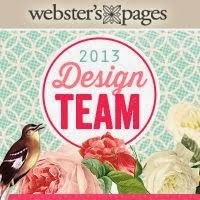 I'm checking in today to share with you a step-by-step tutorial for combining Webster's Pages collections! I love that you can mix and match old and new lines, and for this project I really wanted to try something different by combining two collections that you probably wouldn't think of putting together: Winter Fairy Tales and Once Upon A Halloween. Step 1: I always like to start out a Webster's Pages project by doing a bit of fussy cutting, just to get me started. Step 2: I've used the "Ghosts" paper as my background. And because I like to get the most out of my paper, I've cut the middle out of it (since it will be covered up anyway) to use as the photo mat a little later in my project. 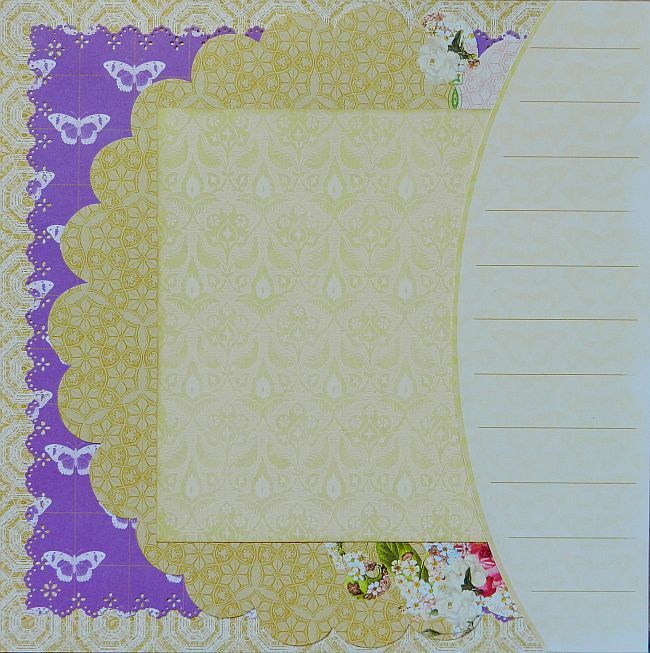 Next, I cut the "Little Fairy Tale" purple butterfly paper down to 10"x10" before border punching the edges. On top of that I layered the "Winter Fairy Tales Die Cut" Paper before adhering an 8"x8" piece from the "Night Owls" paper. Finally, I added the fussy cut section from the "Little Fairy Tale" paper along the right-hand side to act as a base for my journaling. Step 3: Now it's time to start to put things together! I've added a book page underneath the circle photo mat cut from the "Ghosts" paper. Step 4: The purple Perfect Petals flower from the Once Upon A Halloween collection takes center stage. I thought it would be a great meeting point for my banners which were cut from more of the "Night Owls" paper. 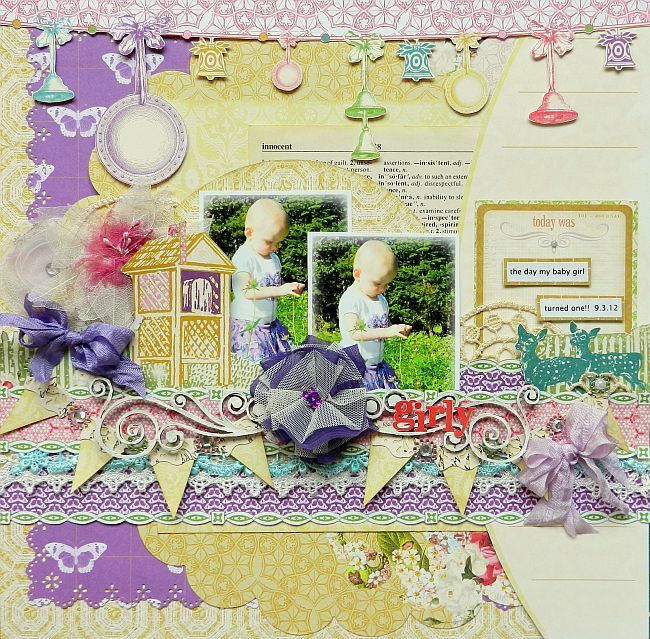 Then I added some trims from the Everyday Poetry Trim Pack. Finally, I tucked a Florette behind the mailbox. Details, details, details~! 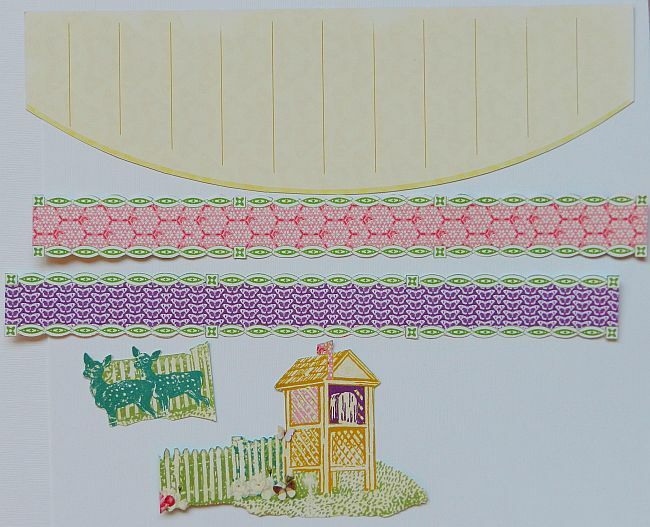 This is where I have the most fun with my project- piling on the pretty little things that bring the layout to the next level; from the punched strips and bling on my banner to the bows, title, and fussy cut additions- all bringing just a little more interest to make this project complete. WOW! 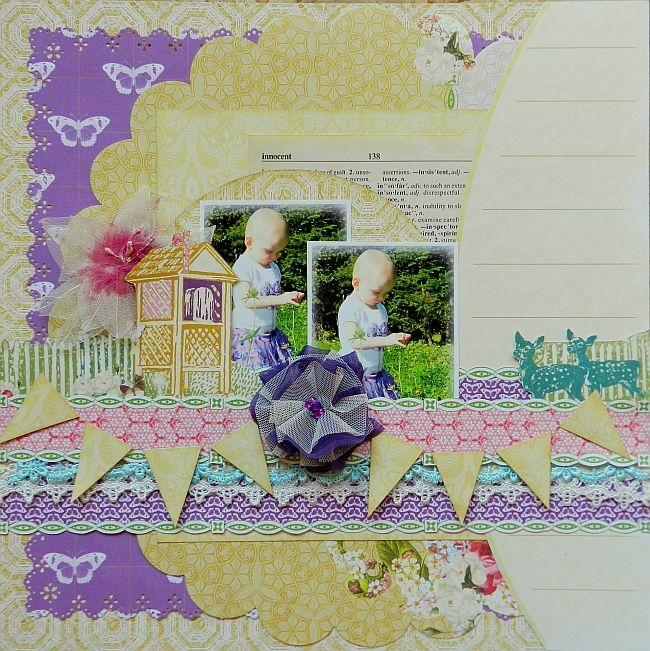 Love how you assembled this fun page! Gorgeous!!! oh what a beautiful layout- the colors are just amazing! Amei o PAP!!! Muito lindo e bem explicadinho!! 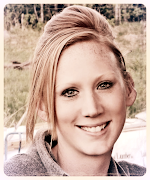 So pretty Erin!! I love the pink, teal and purple and the saturation of each color is a perfect complement to each other!! And adding the pretty flower as the meeting point for your banners, was a perfect touch! Wonderful tutorial on this beautiful layout! Thanks for sharing! Thanks for showing us into your creative process :) I must admit i really love the colours in this one and i love how you have used a halloween range and a xmas range fabulous!!! Your daughter is adorable and this page is gorgeous as always! I love the purple colors. This is amazing, you make it look so easy, however it is in the details that your layouts really come together in a stunning way.. beautiful layout..
so fun to see your step-outs!